One of the things we run into, as we’re sure many of you do as well, is the tendency to fall into the same pattern meal after meal. This might mean a salad plus protein for lunch or finding ourselves making large protein main courses for dinner every night and living off the leftovers throughout the week. While it’s great to find comfort in your food, inviting some change is also important – it keeps things interesting! 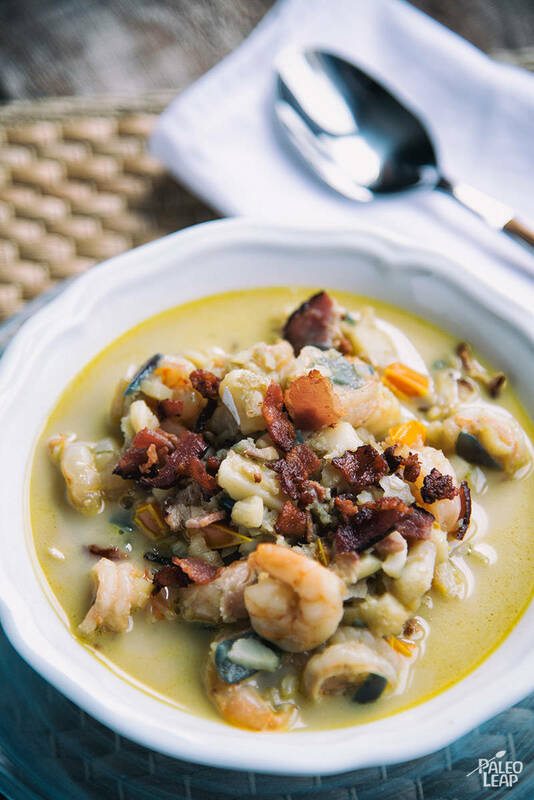 One of the ways we love to do this is to venture outside of our normal routine and trying something like this dish – a fish and bacon chowder that’s perfect as a main course for dinner, making and freezing for lunch, or as one piece of a larger meal. This dish incorporates some of the best Paleo ingredients to create a chowder that’s simple and quick to prepare. You’ll definitely have some freedom here to pick the seafood ingredients that work best for your budget – for example, while peeled and deveined shrimp is much easier to work with, if you have the time to complete this yourself, you’ll save some money by purchasing your shrimp without these removed. As always, remember to consider the source of your seafood and take the time to learn about what you’re buying. While this chowder is perfect as a light, stand-alone course, we think pairing this dish with a salad really rounds out the meal. Try this grilled eggplant and sun-dried tomato salad for a great complement to the flavors of your chowder. Add the onions and garlic and cook for 4 to 5 minutes, or until onions are translucent. Add in the shrimp, bell pepper, and fish; cook everything 4 to 5 minutes while stirring. Add thyme, paprika, sea salt and freshly ground pepper to taste, stirring frequently for 2 minutes. Deglaze the saucepan by adding the chicken stock and scraping the bottom. Poor in the coconut milk and bring to a boil; then, lower heat to medium-low. Simmer 12 to 15 minutes; serve garnished with crumbled bacon.